Myxomatosis and Viral Haemorrhagic Disease. These are mainly transmitted from wild rabbits although insects can carry both diseases, so even house rabbits are still at risk. 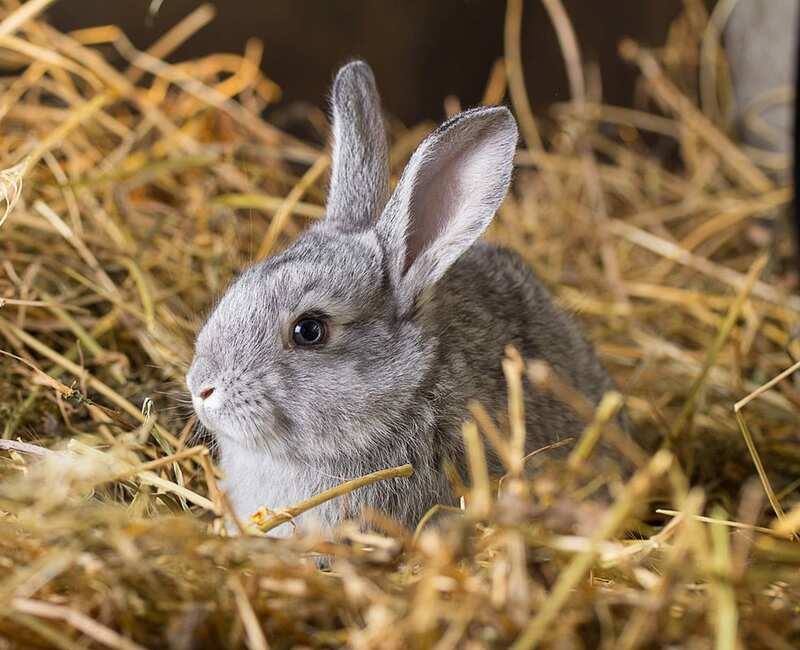 We strongly recommend that all pet rabbits be vaccinated on an annual basis with the combined vaccination for Myxomatosis and Viral Haemorrhagic Disease. Yearly booster vaccinations after an initial course is necessary to maintain immunity. Female rabbits can be spayed from four months of age. Prior to spaying, your rabbit shouldhave a health check with your vet. It is important to provide your pet rabbit with protection against parasites. They can be affected by worms (roundworms and tapeworms), fleas and flies (causing flystrike). Worm infections can cause weight loss and diarrhoea whilst fleas cause skin irritation and transmit tapeworms and myxomatosis. Flystike is a horrible condition that can affect rabbits, especially in warmer weather. Flies lay eggs on your rabbit that hatch into maggots which eat the rabbits flesh. This is extremely distressing to you and your rabbit and can often cause death. Flies are particularly attracted to rabbits that have faeces stuck to their rear end or wet dirty hutches. It is therefore important to check your rabbit thoroughly twice a day and keep their hutch clean and dry at all times. There are products that can be used to repel the flies to reduce the risk of flystrike affecting your rabbit. Which parasites you need to protect you rabbit against depends on their lifestyle and if they are indoor or outdoor bunnies so speak to one of our staff to find the best protocol for your pet. Appropriate feeding is incredibly important to rabbits and if done correctly can stop a variety of health problems form developing in the future. Correct feeding can reduce the risk of dental disease, urinary tract disease, obesity and gastrointestinal diseases like diarrhoea. The main component of any rabbit’s diet should be fibre, which can come in the form of hay or grass. It is important that your rabbit does plenty of chewing so only a small part of their diet should be pelleted food or fresh fruit/vegetables. Many companies now provide health insurance for your rabbits as well as your cats and dogs. This helps you to cover the cost of any illness or injury your rabbit may suffer from. ​Speak to one of our staff about the rabbit health care plan available here at Rutland Veterinary Centre. This includes routine vaccinations, health checks and parasite control and allows you to spread the costs throughout the year. Fly strike is a veterinary emergency, which can become serious or fatal very quickly. It occurs when certain types of blowflies lay their eggs on rabbits. These eggs hatch into maggots that start eating the rabbit’s flesh. As these flies are attracted to wet or dirty fur, try to ensure that your rabbit and its environment is clean. Clean the hutch regularly, provide clean new bedding. Make sure that your rabbit has a healthy diet to avoid diarrhoea or urinary issues. If you notice any signs of flystrike, call the practice. Even if it is an emergency, try to keep calm, call the vet as soon as possible and never give human medication to your pet.